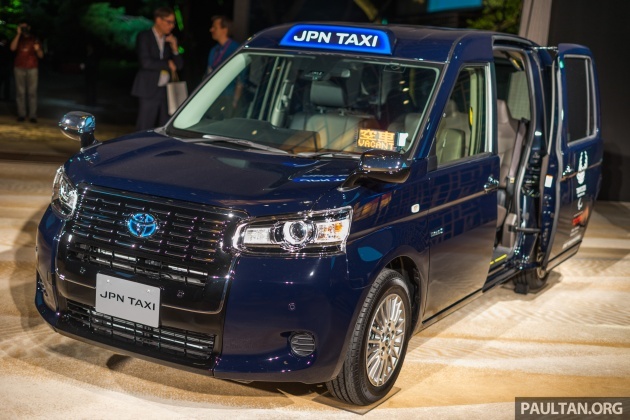 For decades, Toyota’s Comfort taxi has been the cab of choice in Tokyo and the rest of Japan, but that’s about to change with the introduction of the new JPN Taxi. Currently on display at the Tokyo Motor Show, the new model has been built from the ground up to suit a greater number of people – including children, senior citizens and wheelchair users – in the run up to the 2020 Olympic and Paralympic Games here. Unlike the conventionally-styled Comfort sedan – which Toyota admits can be mistaken for a regular vehicle, especially in the usual Japanese black – the JPN Taxi has a tall, somewhat bulbous hatchback look. The design is said to be easily recognisable, and the company aims to make the vehicle an icon of Japan, much like London’s black cabs or New York’s yellow taxis. Design cues include a horizontal lattice pattern on the front grille that takes after the Comfort, as well as large rear doors shaped like a sedan’s, imparting a feeling of dignity. Wraparound tail lights are said to give the JPN Taxi a more modern look, and the hatchback opens up to reveal a 401 litre boot, capable of storing two suitcases horizontally and four golf bags. The effort to create a more iconic look even extends to the newly-developed paint colour, a deep indigo hue called koiai, bringing to mind indigo-dyed clothing worn by the Japanese since ancient times. Buyers can also choose between black and white options. All colours have been designed to make vehicle repairs easier, so that it’s cheaper to fix after an accident. What’s more, the three-piece front and rear bumpers enable the side pieces to be replaced, and the outer lenses of the head- and tail lights are also replaceable. Cabin ingress is eased through a wide sliding kerbside rear door, a low floor height of just 320 mm and grab handles on the door sill and the roof. Once inside, passengers will find plenty of space, with 1,065 mm of rear cabin length and 230 mm of headroom. 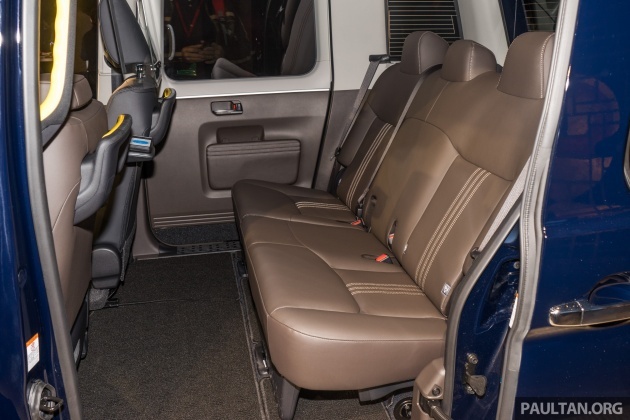 The use of plush, flat seats allows users to slide inside more easily, and there are illuminated seat belt buckles and seat belt extenders to help you fasten your belts. Other neat features include twin USB charging ports behind the driver, a Nanoe air purifier and the optimised use of sound absorption, soundproofing materials and high-quality soundproof glass to ensure quietness. 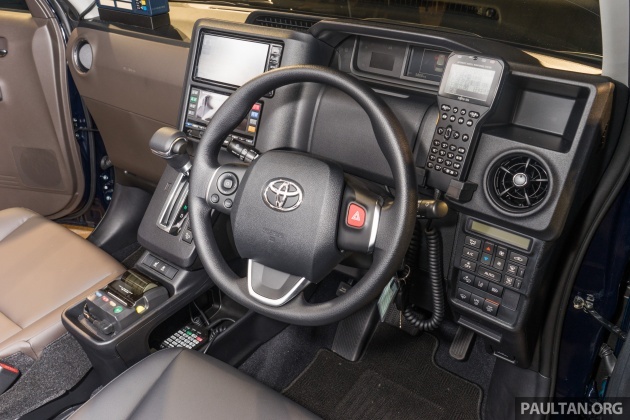 At the front, the dashboard has been designed with the driver in mind, with controls for features such as the vehicle dispatch system and air-conditioning are grouped on the right side. Meanwhile, the navigation screen, taxi meter and other instruments are placed on the centre console, where passengers can clearly see them. Items can be stowed away from prying eyes inside a cubby hole next to the instrument display, as well as a storage compartment behind the steering wheel. Speaking of which, the right spoke features the hazard light switch, which is said to be commonly used by cabbies. Safety is enhanced with the inclusion of six airbags and the Toyota Safety Sense C driver assist package, which includes Pre-Collision System, lane departure warning and automatic high beam system. An Intelligent Clearance Sonar, which guards against accidents caused by pedal misapplication, is available as an option. Power comes from a version of the Prius c‘s hybrid powertrain, running on liquified petroleum gas (LPG). The 1.5 litre 1NZ-FXP engine makes 74 PS and 111 Nm, and is paired to a 61 PS/169 Nm pair of electric motors to produce a total system output of 100 PS. 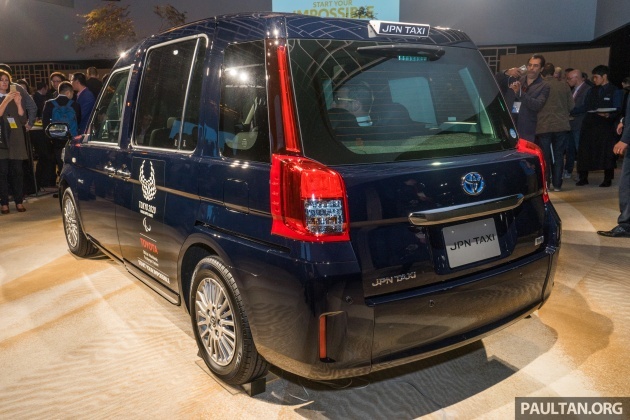 Toyota claims that the JPN Taxi is capable of a fuel consumption figure of 19.4 km per litre on the Japanese JC08 cycle. Above all, a taxi has to be durable and cheap to run, and the JPN Taxi have been built for just such a purpose, with the MacPherson strut front and trailing arm rear suspension designed specifically for taxi use. Maintenance is also reduced through the use of a no-maintenance power water pump. Buyers can choose from the standard Nagomi and high-end Takumi models, the latter benefitting from bi-LED headlights, vertical tail lights in the D-pillar, body-coloured bumpers and chrome exterior trim. Inside, the range-topping version receives more intricate seat stitching, a rear air blower and heated rear seats. Pricing of the JPN Taxi stands at 3,277,800 yen (RM123,100), or 3,499,200 yen (RM131,400) for the Takumi. If its used as a cab, its fine with me. The most important criteria of a cab is they must be clean, airy, seat comfortably & have space for your luggage. The rest is secondary. KL sentral to setapak rm900 fare using helikopter iswara. requirement for passengers – spacious, easy to enter/exit, wide opening doors, comfortable seats, large luggage capacity. For a moment, the blue colored sign on top reads like “JPJ TAXI”. But taxi and uber in japan expensive like hell…medium and lower class japan citizen always used public transport. Japan super punctual and efficient public transport. so no problem.